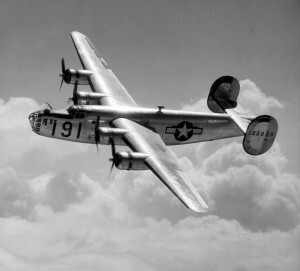 On November 8, 1944, a B-24J, (Ser. No. 42-51001), with twelve men aboard, left Westover Field in Chicopee, Massachusetts, for a scheduled combat crew training mission. Once airborne, the plane headed south over Connecticut. While over Connecticut, one of the engines began trailing smoke and before long flames became visible. Despite efforts by the pilot, the aircraft continued to loose altitude, and it became apparent that an emergency landing was the only option. The pilot aimed for an open area of pastureland located off Route 9 in East Granby, on what was then known as the Seymour Farm. As the plane passed over the highway it clipped a telephone pole sending it out of control into a marshy section of the pasture where the wings and fuselage broke apart before coming to rest. There was no fire, but one injured crewman was trapped in the crumpled wreckage and it was several hours before he could be extricated. Of the twelve crewmen aboard, five were killed. Cpl. Gaetano L. Fastiggi, a top-turret-gunner from New Rochelle, N.Y., born September 23, 1925. He enlisted in the army on April 5, 1944. He’s buried in Holy Sepulchre Cemetery in New Rochelle. Cpl. Henry Colt Fay Jr., a gunner from Milburn, N.J., born September 12, 1923. He’s buried in the Winsted Old Burying Ground, in Winsted, Connecticut. Cpl. Charles W. Powell, a gunner from Holdenville, OK., born September 7, 1920. He’s buried in Holdenville Cemetery. Cpl. Furman Watson, a gunner from Seneca, S.C., born June 22, 1923. He’s buried in New Hope Cemetery in Seneca. Pfc. Lester L. Shoemaker, a tail-gunner from Hanover, PA., born September 18, 1918. He’s buried in Mt. Olivet Cemetery, in Hanover. The pilot, 2nd Lt. Roland C. Curtiss. The co-pilot, Flight Officer Reese A. McClennahan, Jr. The bombardier, Flight Officer Vincent M. Vallaro. Gunner, Cpl. Francis A. Crawford. Gunner, Cpl. Cono A. Galliani. Gunnery Instructor, Staff Sgt. Charles J. Nigro. The navigator parachuted safely away from the plane and received only minor injuries. Today a housing development occupies the crash site. The Hartford Courant, “Five Flyers Killed, Seven Injured As Bomber Crashes In East Granby”, November 9, 1944, page 1. New Rochelle Standard Star, “Cpl. Gaetano Fastiggi Killed With 4 Others In Bomber Crash”, November 9, 1944. New Rochelle Standard Star, “Fastiggi’s Body Is Escorted Here”, November 11, 1944. New Rochelle Standard Star, “Fastiggi Rites Attended By 300”, November 13, 1944.